2. Payment by credit card or debit card from VISA, MASTERCARD and AMERICAN EXPRESS are accepted. Be sure your 3D secure service is available. Prepaid and Postepay cards accepted. NO PAYPAL. NO BANK TRANSFER. 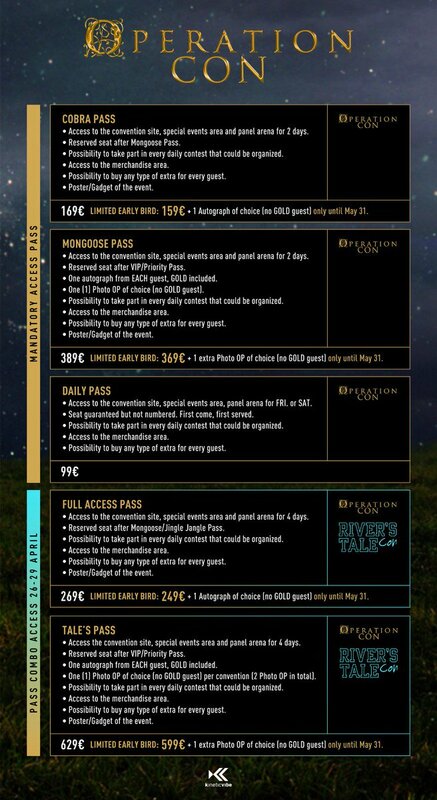 If you want to upgrade your Pass to a higher category you need to wait official announcement about VIP passes. Operation Con is the first Italian convention dedicated to Once Upon a Time! In Milan for the 26th and 27th April we will have some of the amazing and talented actors of the popular TV series! You will be able to enjoy several activities as: Q&A session with fans (Panel), photo sessions (Photo OP), autographs session and exclusive Meet&Greet with a small number of lucky fans. But also many other different activities to bring you into the Fairy Tale's world! This event will be right before River's Tale, convention dedicated to RIVERDALE in the same location on the 28th and 29th April. GUESTS: Colin O'Donoghue, Lana Parrilla, Sean Maguire, Tiera Skovbye, Robbie Kay, Rose Reynolds, Adelaide Kane.... more to come.